Earlier this week, I made the case that an ancient cycle drives the evolution of beer. Choices in ingredients and processes create distinctive regional approaches to beer, eventually becoming unique brewing traditions. The traditional approaches are inevitably disrupted by technological change, which creates what looks like a shortcut or radical departure from the traditional approach. Eventually, those technologies are absorbed and then become hallmarks of a new era of “tradition,” before the cycle repeats. There are two important points to note here. First, these changes never happen at every brewery, and at any given time, most of the stages of the cycle will be present in the form of certain breweries that change at their own pace. Observing this process is one of looking at a bell curve and seeing where the center of the market and culture is at any given time. Second, it’s not always possible to identify what’s “traditional” by looking solely at the beer itself. A pale lager can be made with Czech floor-malted barley in a 19th century brewery practicing decoction mashing, using direct-fired kettles, and open fermentation in wooden tanks; or by highly refined malts and sugars on equipment like mash filters, calandria, and with a spice cabinet full of brewing agents. They may even be in the same ballpark in terms of taste. 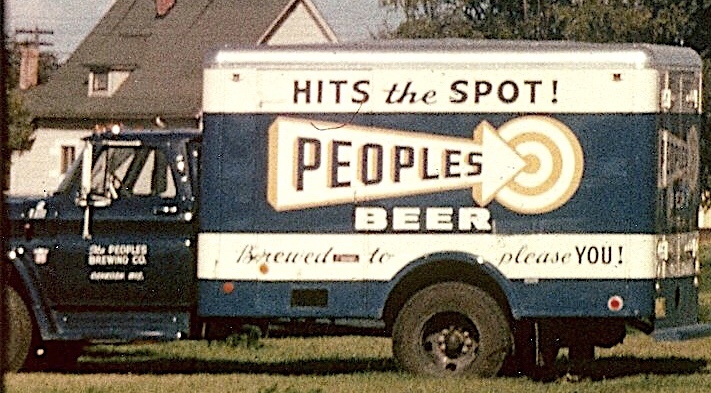 That second point was illustrated to perfect effect by the Oshkosh Beer blog, which recently gave an exhaustive account of the Peoples Brewing Company and how it was making beer until its closure in the early 1970s (hat tip Alan McLeod). This was an era when technology was radically transforming the American brewing industry and making companies like Peoples obsolete. What didn’t change (much) was the beer, which in both cases were pale lagers leavened by rice or corn. But the way these different breweries made their beer describes the space separating tradition and a technological boom. If you are a history nerd, you must go read the post, which is based on a description by the 91-year-old former lead brewer Wilhelm Kohlhoff. The detail is remarkable. Even more remarkable is the process he describes, which appears to be unchanged from the way a 19th century American brewery would have made a pale lager. It’s an old Victorian-era tower brewery that sources it’s water from a well. And from there, it went about brewing beer the way Czechs still do—with a dash of Belgium thrown in. It was bittered with American (probably Cluster) hops, followed by three flavor additions of German hops. A hop jack was used to strain the whole cones, and then the wort was cooled over a Baudelot chiller. The beer was fermented at 47 degrees F for 8-10 days, a perfectly typical length. (The rule of thumb is a day for every point of Plato, and this was an 11P beer.) Fermentation lasted several weeks (up to two months except in the summer when they were slammed). Eighty-five miles south, the national breweries of Pabst and Miller were no longer making beer in the old way. They had industrialized, streamlining their processes to fill the mighty fleets of trucks carrying beer out of Cream City to slake a nation’s thirst. Peoples, meanwhile, was making 35,000 barrels, a number that would dwindle to 25,000 by the time of its closure. None of this is especially important to the layman or even most beer geeks. I get that. But the more I travel and tour breweries and read histories, the more the nature of beer is revealed to me in these processes and ingredients. There’s this powerful human element in brewing, and it Is reflected in the way the beer is made, not what it tastes like. We learn so much by peeking into those processes. It’s just fascinating to observe this process—the one happening in the 1960s, the one in the 1980s, or the one right now. Whether you buy my cycle metaphor or not, I hope you enjoy its goal of focusing attention on all the different ways humans go about making (and thinking about) beer. All photos Oshkosh Beer Blog.